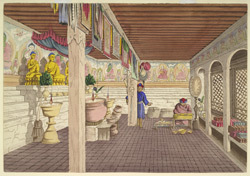 Watercolour of a priests residence at Swayambhunath in Nepal, by Henry Ambrose Oldfield (1822-1871), dated October 1855. The image is inscribed on the reverse: 'Interior of a 'Goomba' or Lama Priests residence at Sambhunath. In the Centre of the Chamber is a large copper cauldron, full of Ghee in which the 'Everlasting' fire is kept burning. The gilt figures of Buddha Sakya Linger, as well as the paintings on the wall, and those hanging from the roof, are all 'Tibetan'. Octr. 1855'. Dr Oldfield, who was Residency Surgeon at Kathmandu from 1850-1863, wrote, in Volume II of his 'Sketches from Nipal, Historical and Descriptive...' (1880), "The principal temple of Sambhunath is under the charge of the Lamas who live in the powah on the western side. They act under the immediate orders of a superior Thibetan Lama, who resides in a vihar or "gumpa" of his own, situated on a low detached hill on the southern side of the hill of Sambhunath. This Lama is deputed by the religious authorities at Lhassa to watch over the spiritual interests of the numerous Thibetans who annually visit Nipal, and also to exercise a general superintendence over the repairs and expenditure of the two great Buddhist temples of Kasha and Sambhunath, which are the repositories of the sacred fire."